Our youngest, Daughter #4, who grew up to be the wonderful writer Sara Marian, and I lerrrrrrvvvv writing exercises! Whenever we’ve done a two-person mini-retreat or have roomed together at a writing workshop, we’ve done exercises. More often than not, we’ve ended up with stories, books, or ideas to file away for later. Open a book, magazine, or newspaper at random and point to a sentence. Use that sentence as the first line of your story. That’s what I did for the picture above. Describe the same static scene or landscape from the point of view of two very different characters. They’ll notice different things, or different things will appear differently to them or they’ll describe them differently. Grab a random word and free-write for five minutes. Just write whatever comes into your head. If you go off on a tangent, go. Set a story in a place you’ve recently been: a museum, the grocery, the back yard. Wherever you are, that’s a place. That’s a setting. It’s specific. Specifics are important. Pick a sense, particularly a sense you don’t reference much in your writing, and make it an important part of a scene. Overdo it, if you want to — this is just an exercise, meant to stretch muscles. 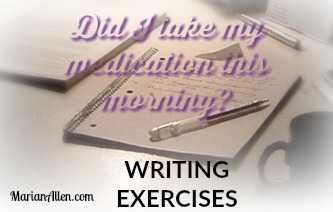 Trust me, throwing yourself into a writing exercise can be refreshing and liberating. It’s a way to do an end-run around your inner critic and open your creativity. A WRITING PROMPT FOR YOU: See above. This entry was posted in Writing. Tagged writing exercises. Sounds like some interesting ways to get the juices flowing. Hound of hell is possibly MY favorite story of yours. (But I do love the wild cow opus!) AND SAGE!!! YOU write on! YOU write! I’m waiting for the next Callie London Vampire Adventure! I already read When Push Comes To Shove twice, maybe three times! And, yes, my head is getting busy again. Soon the notebook! Wonderful fun ideas. I’ve used some before and I’ll try the others. Wonderful way to encourage writing. Even, my son is 5 years old. I often do almost similar stuff. Open a book and give him a random topic from it to write on. That’s great! I expect to read one of his books one of these days. Good job, Dad!